Customers who wish to order more than one light gun must checkout individually for each item, as more than one light gun would be too heavy for the Royal Mail shipping service (2kg maximum). Arcade quality light gun with two buttons and trigger. Ready to play. Available in Red, Blue or Bglack. Recoil guns are shipped without a recoil power supply. The recoil power is routed via the connecting cable and the power supply needs to have a connector with outer diameter of 5.5mm and inner of 2.1mm. The ideal voltage is 36 Volts. 24 Volt supplies will also work but the recoil power will be reduced by approx 20%. The power supply needs to have a current capacity of 2 amps or greater. If you use a 4 amp supply this will give maximum power. Above 4 amps will work but give no power advantage. The pictures below show the cable connection and an example supply. This type of power supply is often available on Ebay. The lightgun is dead! Long live the lightgun! This is incredible that it exists. In a time where lightgun games are becoming an extreme rarity due to CRT TVs breaking down and dying. This device comes along and uses the Wii's infrared technology of it's tracking bar and delivers the best imitation of a Guncon you can get for PC. Sure, it's not spot on and most games still need a cursor for accuracy, but here I am enjoying Time Crisis, Point Blank and MAME lightgun games on a PC. The gun need to be callibrated by a basic method shooting your cursor in corners of your monitor, it's a bit tricky at first, but get your distance right and you can get some great pin point accuracy, some emulators such as PlayStation need additional calibration using NuVee plugin to bypass the Guncin callibration screen. Due to it being recognised as a mouse once plugged in (optional to change to joystick) this enables you to play games which would be usally run with a mouse and I found myself playing my Steam copy of Typing of The Dead Overkill's bonus House of the Dead Overkill mode for a good few hours, I then tried my abandonware copy of Area 51 for PC, this also worked brilliantly, I then tried some Amiga emulated cursor shooting games, brilliant results. I really recommend ithis device, just as plug and play, it's excellent and will be the nearest we'll ever get to CRT TV/Monitor games in your room again. Aimtrak are preserving a whole genre and history of games with this device alone and it's brilliant, well worth the money for that classic arcade/Guncin experience once more. guns fairly accurate once calibration is correct, did expect full recoil action but only has vibration recoil. overall pretty decent if a little pricy for just vibration feedback. went straight into Virtua Cop and it worked straight away. Did the calibration anyway to go through the process which was quick and simple as holding down the trigger for 5 seconds and shooting at the cursors as they move corner to corner. This gun is brilliant and very accurate. I have an arcade cabinet with CRT so i had to take the sensor out of the plastic surround and i taped it on top of my monitor. Observations so far.... Make sure you point the sensor down a little seems to work better that way. 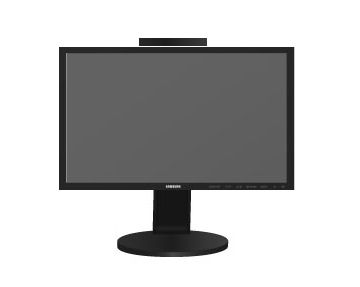 There is a sweet spot of about 3ft from the screen, any closer and the cursor goes nuts. 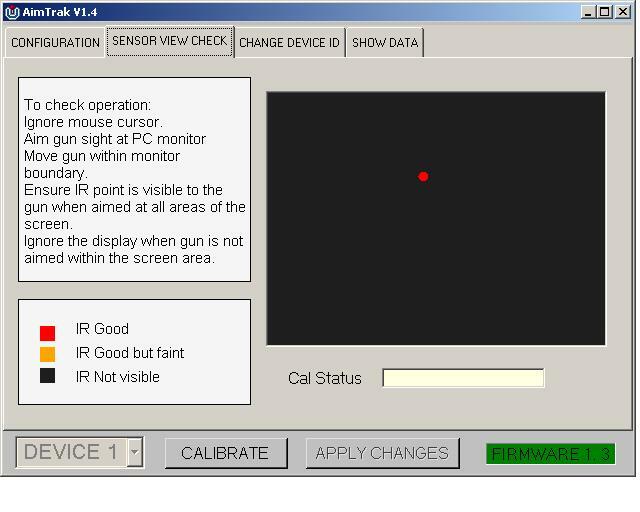 Make sure you calibrate in the position you are going to use the gun. I am having trouble getting it to work in mame on certain titles (lethal enforcers) The cursor is super sensitive in the X axis and no matter what settings i have it won't work properly. Its not the gun as it works flawlessly in VIrtua Cop. I would highly recommend buying the Aimtrak Lightgun with the force feedback installed already. This saves a lot of hassle as its not the easiest of things to fit. The feedback with that power supply is plenty powerful enough and is quite noisy but i love it. Bought 2 of these babies after my both EMS Topgun 3 broke (bad quality product), now I am never turning back to EMS, since these guns are way superior to any other light gun on the market and I have tried a few of them. I have not managed to try recoil yet because I have not bothered buying a power cable yet. But so far I am super happy with the 2x Aimtrak's, 1:1 in both Model 2, 3 and Mame, Ignore what the official website says about model 2 only being 1 player there is a program called demulshooter that makes it possible to play 2 players. These babies even work with Wii (Dolphin Emulator) if you know how to set em up for it's light gun games. But remember if you are playing on something bigger than 32 inch get the super ir bar. Bought 2 of these for my Hyperspin setup, for use with multiplie emulators but mostly MAME.. was very happy with the look and feel of the guns.. they are the best solution for playing light gun games on a modern pc/tv. Unfortunately i thought that the guns recoil feature was similar to the Time Crisis arcade cab system.. this was not the case. They have a similar solenoid inside but it does not move the top slide of the gun when you fire. They do give a satisfactory sensation when fired which can be tuned with the official software utility, if i had known this in advance i think i would have opted for just the sensor pack and fitted them in a real arcade variant. Also for the price of the recoil guns i would have liked the power pack to come included, as this had to be ordered separately from china. Best light gun I have used for years! I have always loved Light gun games, From playing Duck Hunt right through to Time crisis etc they have always had a special place in my heart! So of course for my cabinet I had to have 2 so I could play point blank etc! The guns are not the niceist in terms of looks but they feel nice in the hand not to heavy not to light and they work really well! I have tried several other PC light gun solutions including the top gun and others but none have come close to features and ease of the Aim traks. Setting them up is pretty easy in Mame and I have got them working with several emulators including Sega M2, American laser games and a few others. Some of the emulators require additional bits of software and some buggering about but I wont go into that on here! The utility that comes with them is a great help for setting them up and fault finding on the guns. The problem that pretty much all lightguns suffer from is the loss of calibration when moving around or being used by a person of differing height etc. This is easily solved with the aim traks as they can be re-calibrated on the fly in game if needs be without ever leaving the game! 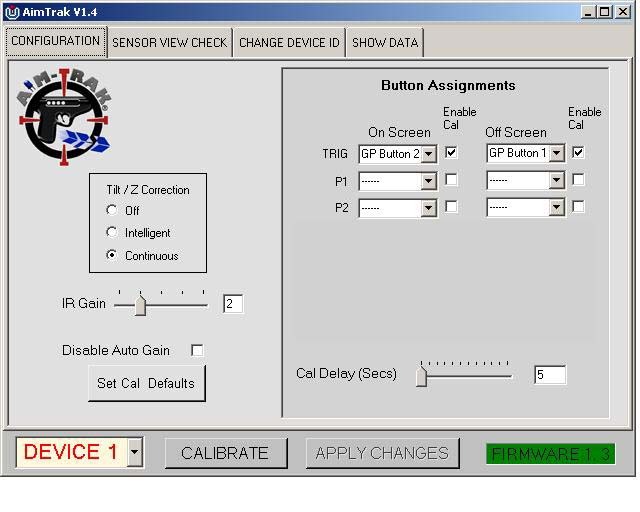 In terms of calibration though the hold well and as long as I stand in the same spot I can pull it from its holster after it being sat there for weeks and it will be dead on the money, if it needs to be re-calibrated its a 30 second task. I have found though that they do not like bright sun light or lots of refelctive surfaces though so dont try to play with the infront of windows etc. In terms of installation they are very easy as they just plug into the USB ports on your PC and are registered as Mice. You also have to install the sensor bar which is again USB and can support multiple guns so you dont need to use several bars! These really are the best light guns I have come accross for use with a PC.